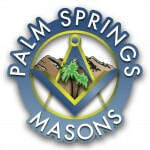 Lodge 693 meets at the Palm Springs Masonic Center, 450 South Avenida Caballeros just outside of downtown Palm Springs. Degrees are scheduled on Tuesday nights, as new candidates are initiated and Brothers proceed through the Degrees. Scheduled Degrees are posted on this website, in the monthly Lodge 693 Trestleboard, announced by e-mail, on Facebook and on Twitter: @Lodge693 . The Palm Springs Masonic Center is easy to find!